Einstein Exchange, one of the world’s fastest growing cryptocurrency exchange announced extraordinary customer growth as a result of the launch of the Company’s free mobile wallet & trading applications. Within 14 days of launch, the Einstein added over 60,000 new customers, representing over 100% growth in total customer count, and over 20,000 verifying their identity within the app’s proprietary KYC engine. Einstein released its cryptocurrency mobile applications on Apple’s iOS Store & Google’s Play Store in the first week of March 2019 featuring free cryptocurrency trading, in-app identity verification, unlimited Visa (NYSE: V) & Mastercard (NYSE: MA) funding with mobile 3DS security and unlimited $10 referral bonus to all customers who verify their identities. Both Apple (NASDAQ: APPL) & Google’s (NASDAQ: GOOG) Android apps soared to the Top New Free and Top 100 Free Finance apps, respectively, attracting over 10,000 new downloads per day and driving over 19,000% increase in the exchange’s trade volume. “Einstein’s mobile applications had a stunning & extraordinary debut. It took us 18 months to acquire our first 65,000 customers, whereas our mobile apps clearly showed tremendous value on a global scale for us to be fortunate to acquire over 60,000 new customers within 2 weeks,” said Michael Gokturk, Einstein’s CEO. 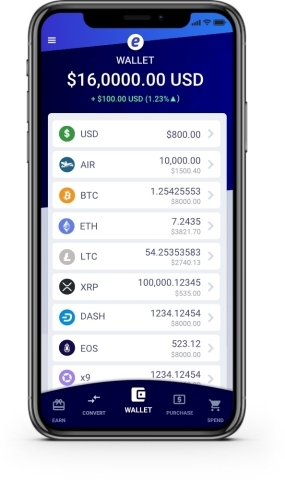 Einstein Convert, the Company’s featured mobile crypto wallets, enable customers to Convert, Earn & Spend over 19 different types of cryptocurrency from the safety and security of their mobile phones. Customers can convert into any cryptocurrency commission-free, earn $10 for every friend they refer to the app, and spend all or part of their wallet balance by using their free Einstein electronic credit-card issued right to their mobile phone. Einstein Exchange is a Canada-based crypto-currency exchange launched in 2017 which now enables over 125,000 customers to convert, earn and spend crypto-currencies such as Bitcoin, Ethereum, Litecoin and more, all for free. Einstein is registered with FINTRAC in Canada as a Virtual Currency Exchange. Einstein works with all major banks and is licensed to accept Visa, MasterCard, Interac, Flexepin, and SKRILL for customers seeking to invest in crypto-currency.